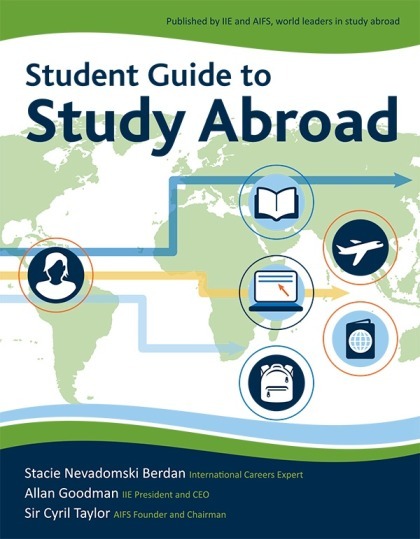 Packed with user-friendly “how to” information offered in a fun and engaging style, A Student Guide to Study Abroad includes 100 practical, easy-to-follow tips and more than 200 real-life stories from students, advisers and professionals. Written by three leading study abroad and career experts, this guide makes it clear that study abroad is more flexible, affordable and accessible than ever before, and that there is a study abroad option for just about everyone. The guide addresses the needs of all students as it offers targeted advice for students from diverse backgrounds and different fields of study, and addresses practical considerations related to topics such as disabilities, race and ethnicity, sexual orientation, and financial need. For more information about the book, visit: www.iie.org/studentguide. For more information about the Generation Study Abroad campaign, visit www.generationstudyabroad.org. You can download your free copy of A Student Guide to Study Abroad from any computer, phone, or e-reader. Just go to www.iie.org/studentguidedownload and select the file format that works for you.